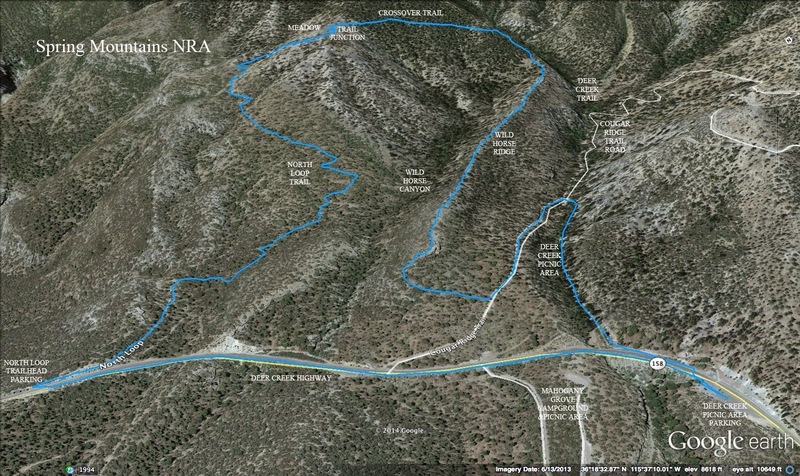 Four hot women and two hot men hiked the Sawmill Wiggles Loop today in the Spring Mountains NRA. 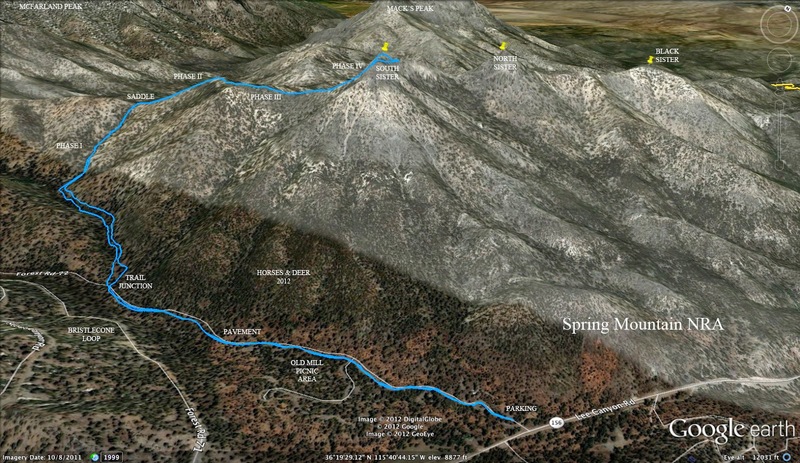 We parked at the Sawmill Trailhead parking area and began our hike on the Yellow Trail. We meandered through a desert forest setting until we junctioned with the Red Trail where we took the left fork and started up. The next junction is not well marked but taking the right fork, we changed to the Green Trail where we hiked a small ridge with wide open views of surrounding peaks and desert. Macks Peak, seen in the photo to the left, was one of the peaks. The temperatures were high, today, but we were all prepared. A slight breeze anointed us from time to time. Coming down off of the ridge, we found the Blue Trail junction turning to the left. This is the beginning of the Wiggles Route and we found the left turn to be more used than our previous hike one month ago. 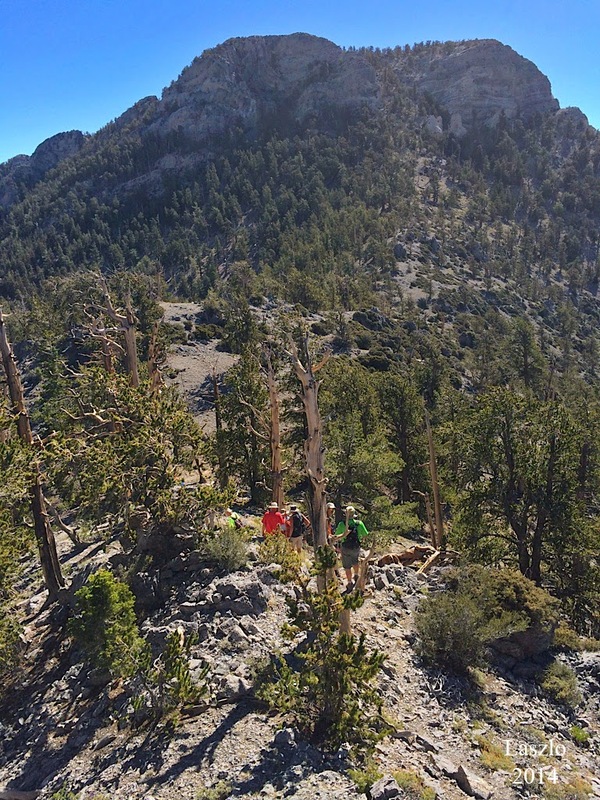 Before we got below elevation of the big trees, we took a break underneath large junipers and pinyon pines. Our hike continued down the Wiggles until just after we crossed a dirt road. Here, we dropped onto an old road wash and began heading back in the direction of the cars. Trying to keep a straight path in that direction, we paralleled Lee Canyon Hwy while listening to the large construction trucks struggle up the mountain. Soon, we connected with Cardamine Road, a dirt road that led straight back to the cars. Twelve hikers climbed South Sister this morning. All reports were that it was a great hike! Laszlo and Anthony offered a few photos and Mike OC wrote a few words. 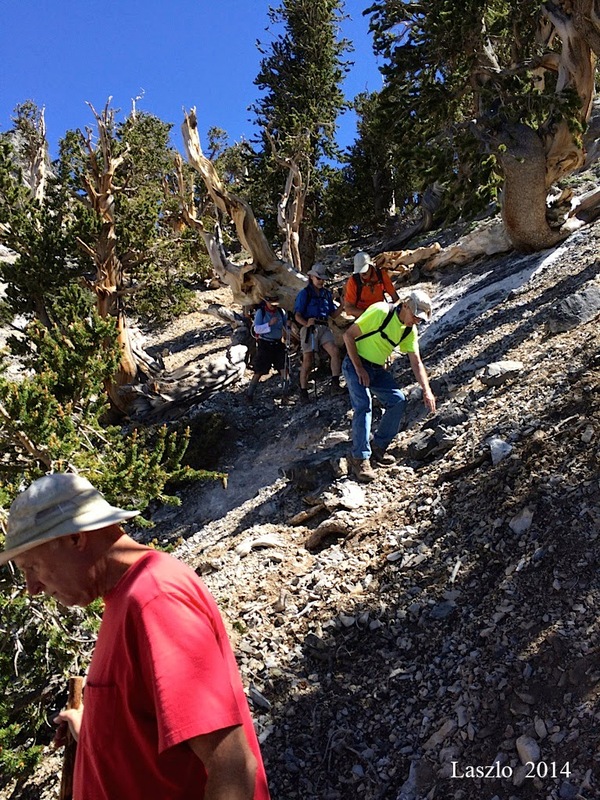 The hikers started from the Lower Bristlecone trailhead off of Lee Canyon Highway due to the ongoing construction in the Old Mill Picnic Area. 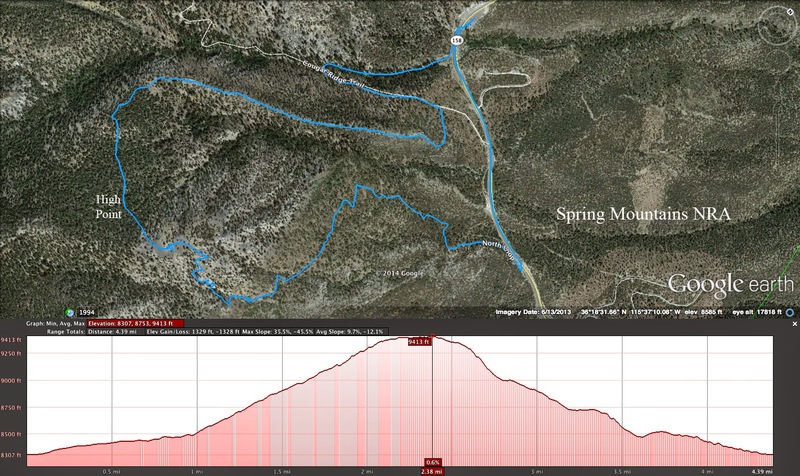 The hike can be described in four phases. Phase 1 : Leaving the Lower Bristlecone trailhead, the hike starts up the forest road of Lower Bristlecone but makes a right turn at the manhole cover to begin the crossover to the regular trail above the adjacent picnic area. 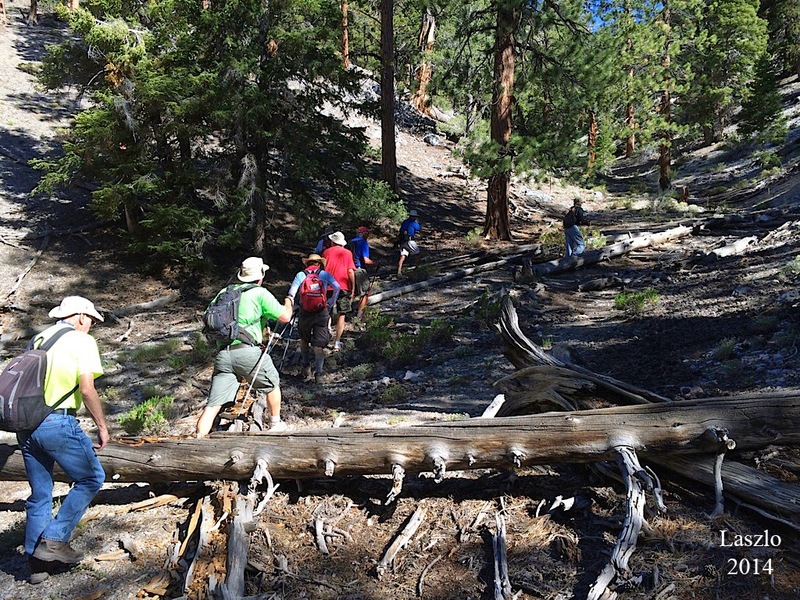 After connecting with the South Sister Trail, phase 1 leads the hikers up next to a wash that becomes more and more steep as the climb progresses until the South Sister Saddle is reached. Phase 2 : After a brief rest at the saddle, the route turns to the right and balances on the ridge all the way up to the intermediary ridge above. This is where South Sister appears across a green canyon. Phase 3 : The hike continues along this intermediary ridge to the right. There is a small trail, here, that undulates along the rocky terrain. 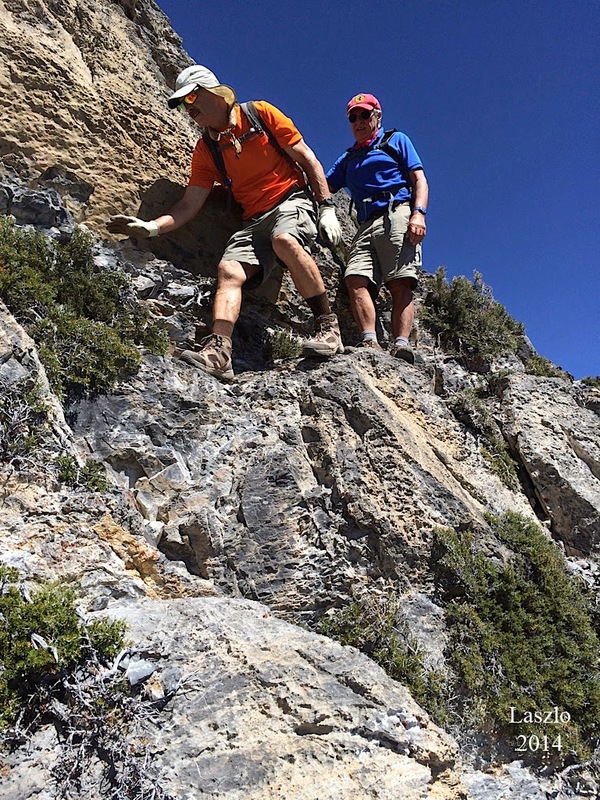 It is clear that you have reached the end of Phase 3 when a loose rocky ascent stares at you in your face! Phase 4 : The loose rocky ascent staring at you in your face! Although this last phase of the hike is a little challenging, it is definitely the most beautiful. It gets over quickly enough and then there is a small scramble up to the crown of the summit. On the summit, there are views for 360 degrees that include Mt. Charleston, Lee Canyon and, closer, North Sister and Mack's Peak. Twelve mountaineering apostles attended services on the final Sunday in June atop South Sister. At 10,175 feet above sea level. A third of the group made the ultimate sacrifice--blood! Another third took the Class 3, backdoor descent from the summit. 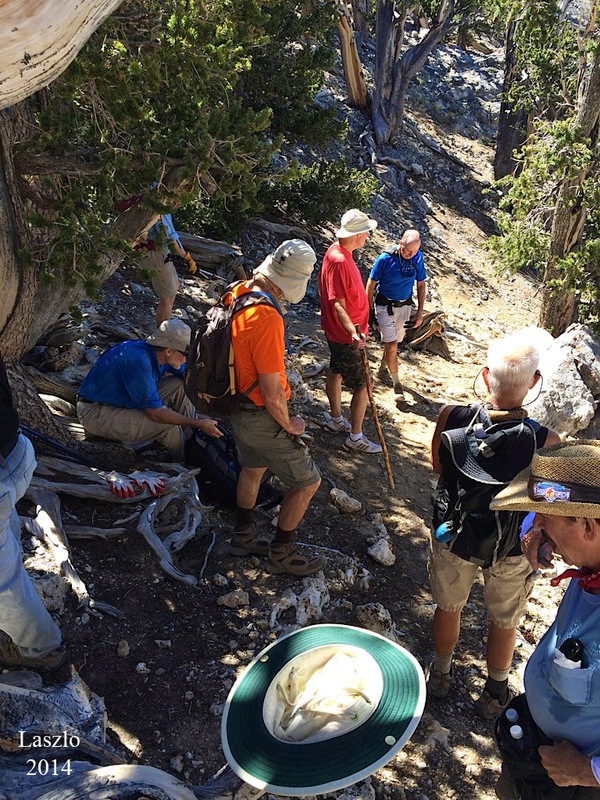 All 12 returned safely to Lower Bristlecone in well under four hours. And no one got lost! Can I get an 'Amen' here? And just who were these devout dozen? There was Don Caldwell, Helmut DeCandia, Mickey Schleicher, Scott Hardy, Tim Borem, Anthony Rayner, László Herédy, Dennis Rohne & Carl Weller. And a pair of Steve's, Allen & Newell. And moi. 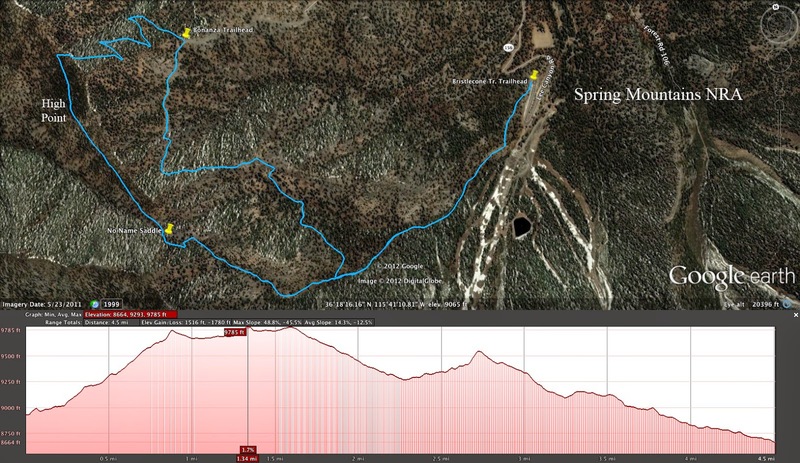 Vitals: 12 pious trekkers, 5.2 miles, 2.1k vertical, 3.7 hours. By the time the hike was finished this morning, the count was around twenty hikers! We had late comers, early comers and joiner-innners! Yep! We had a great time! 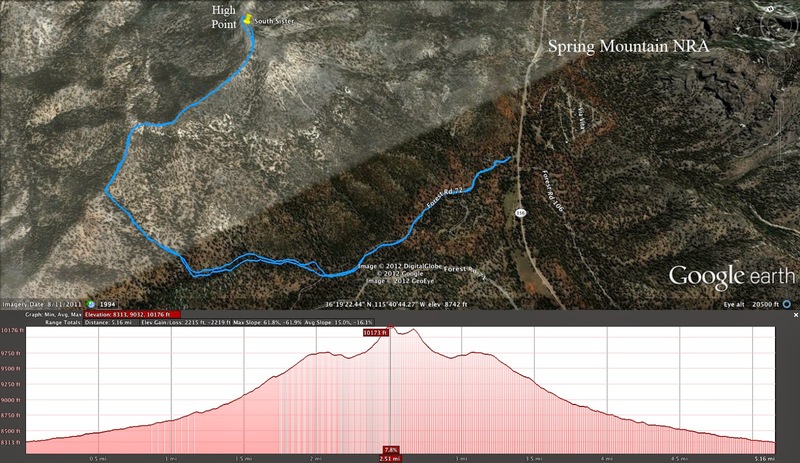 Anyway, today's hike of Wild Horse Ridge deviated from the regular same old route. We parked at the Deer Creek Picnic Area parking lot (spelled r-e-s-t-r-o-o-m-s) and began our hike by trekking up highway 158 toward the North Loop trailhead. At the trailhead, we were instructed to continue up the North Loop Trail at our own pace until we reached the North Loop Meadow. This enabled all of us to get a good workout no matter what level of condition we were in. The 1.5 miles with 1000 feet of elevation gain provides plenty of opportunity to blow out the arteries. We arrived at the meadow in small groups. This was our snacking destination so we found shade to sit in and proceeded to dig through our packs while we waited for the last hikers to join us. 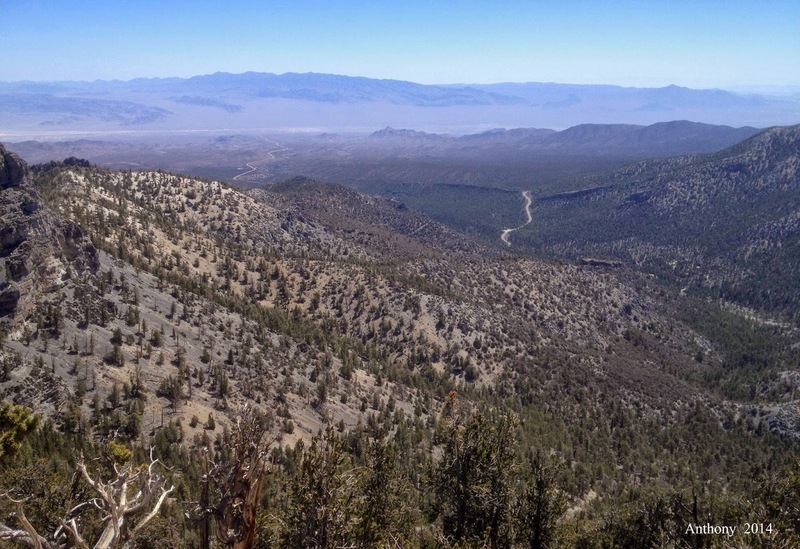 The North Loop Meadow is a large open space on top of an intermediate ridge surrounded by old bristlecone trees that have been twisted by the wind. In the distance, you can see Las Vegas on one side and the Nevada Test Site on the other. As we waited and snacked, it was a good chance to get to know some of the newbies of the group. 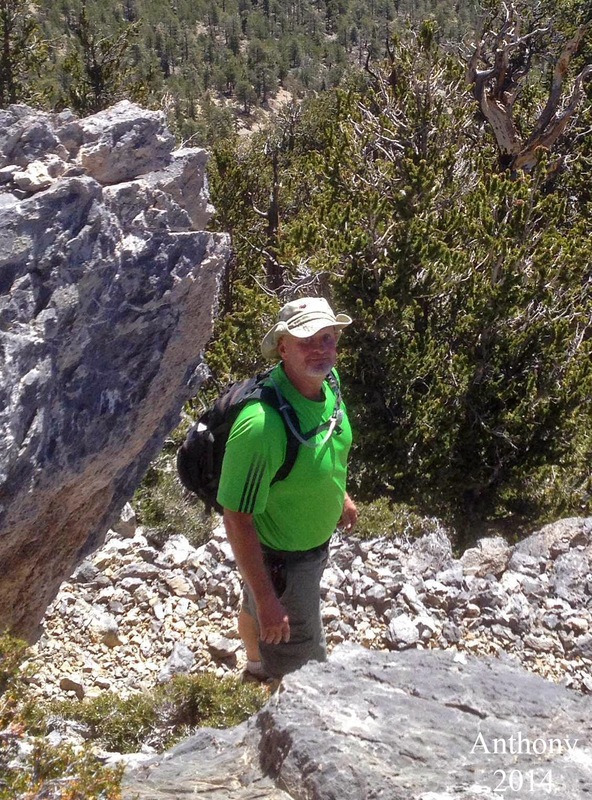 The Saturday morning 8:30 hikes are custom made for new hikers of all levels. 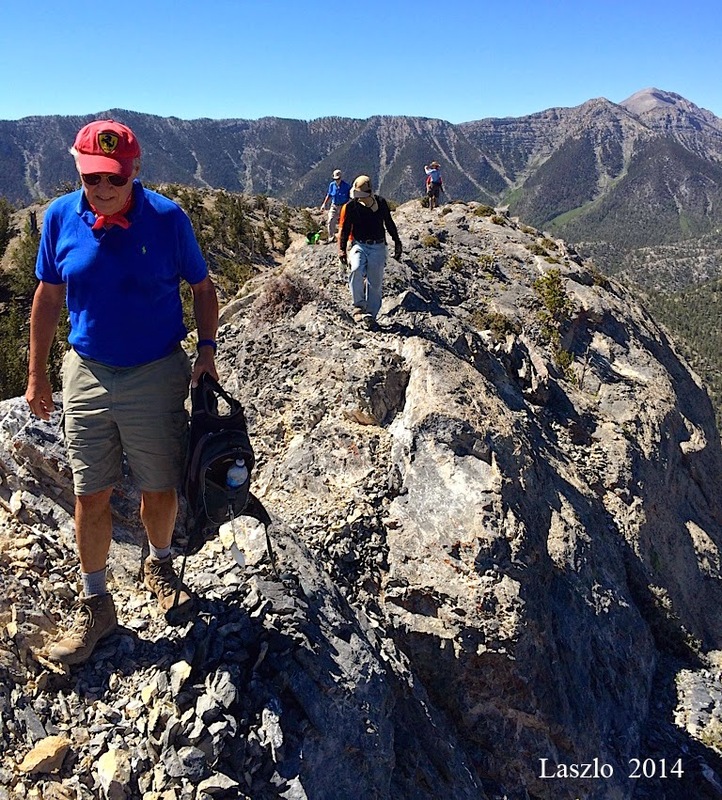 During these hikes, newcomers learn what level of condition they are in and what kind of tolerance they have for the increased altitude. 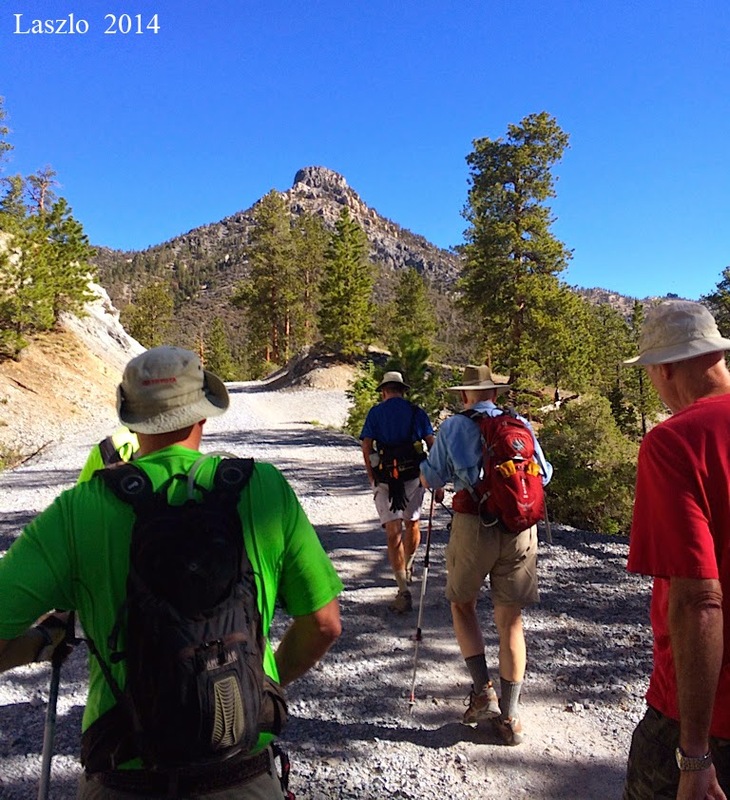 From these easier hikes, they can decipher which other hikes during the week that they would be able to do and which other hikes they can work up to doing. When everyone was accounted for and we all had a nice break, Chris led us up to the beautiful old tree at the far end of the meadow where the Crossover Trail junction lies. We followed Chris on a small wooded trail. 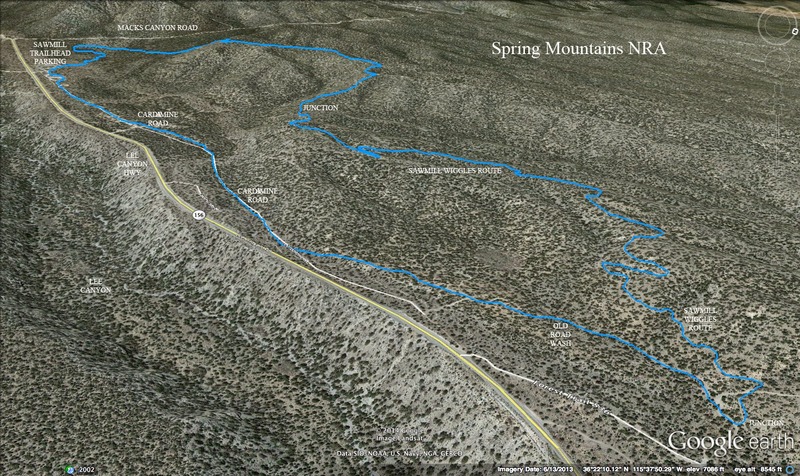 The distinct trail turns into a sudden steep descent that leads into Wild Horse Canyon. We did not take the turn but continued on the Crossover Trail until we were at the top of the neighboring ridge. At the point where we could not go any further without making a very steep drop ahead of us, the small trail makes a turn to the right and leads down to the beginning of Wild Horse Ridge. 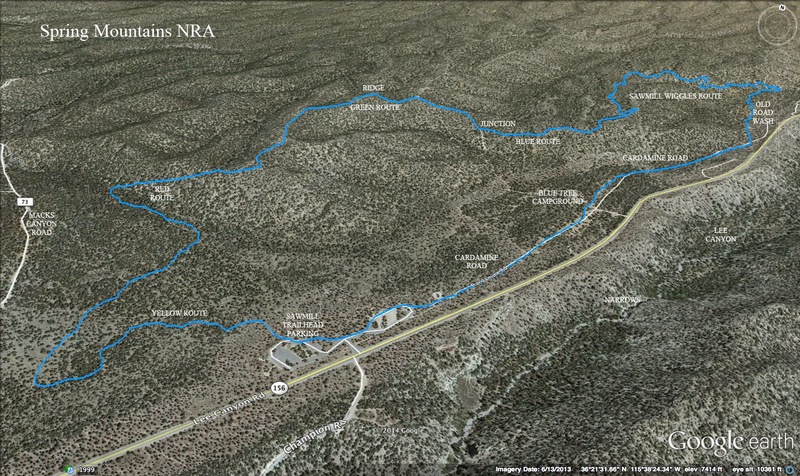 A small trail that you see appearing out of the forest at the beginning of the rock ridge is called Cactus Jack's Trail. Someday, we will have to explore the small connecting trail to see what it connects! 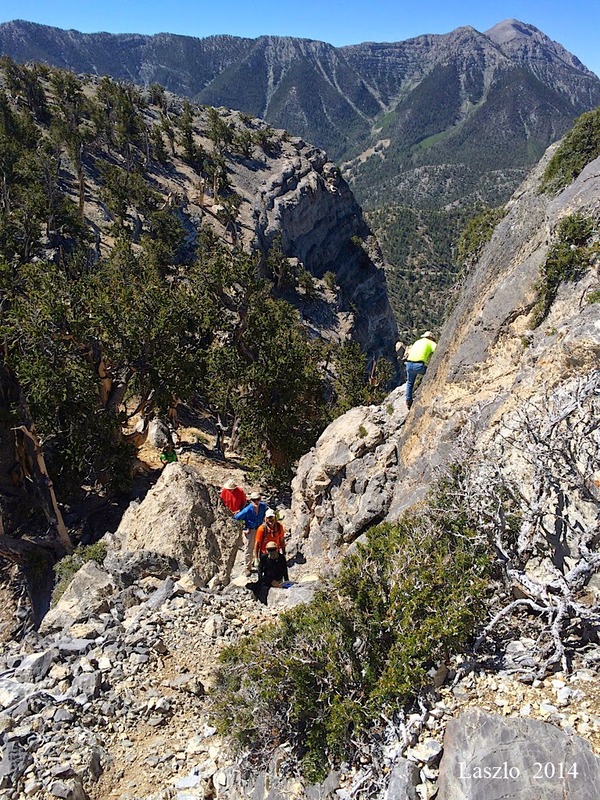 We mounted the rock ridge and immediately took in the various and vast views. Chris was great, as usual, at leading an interpretive hike for those who had no idea where they were as yet. We hiked down the long rock ridge made of a conglomerate stone. Mummy Mountain was behind us and Angel Peak was in front. To our left, we could see the first half of the Cougar Ridge Trail road which services the cabins and summer homes in this area. Along the ridge, mountain mahogany trees grew abundantly. We dropped down the end of the ridge and turned to our left to continue dropping to the Cougar Ridge Trail road. From here, we turned left, hiked up the road to the pavement on the right. This pavement descends down through the Deer Creek picnic area where there were many people enjoying the trickling stream and picnic tables. 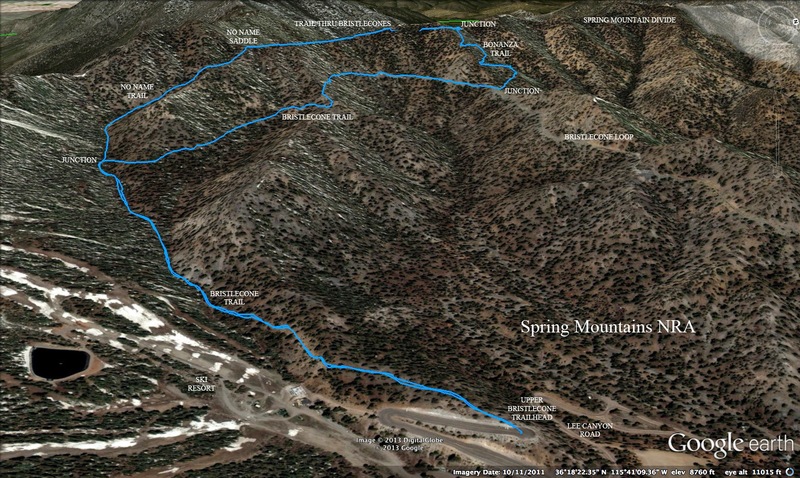 Returning to our cars, we were surprised to have hiked 4.6 miles with 1200 feet of elevation gain in 3.5 hours. Seventeen friends came out on this overcast morning for a hike in the Spring Mountains NRA. The trail du jour was the tried and true No Name Loop that we would do in a clockwise direction. 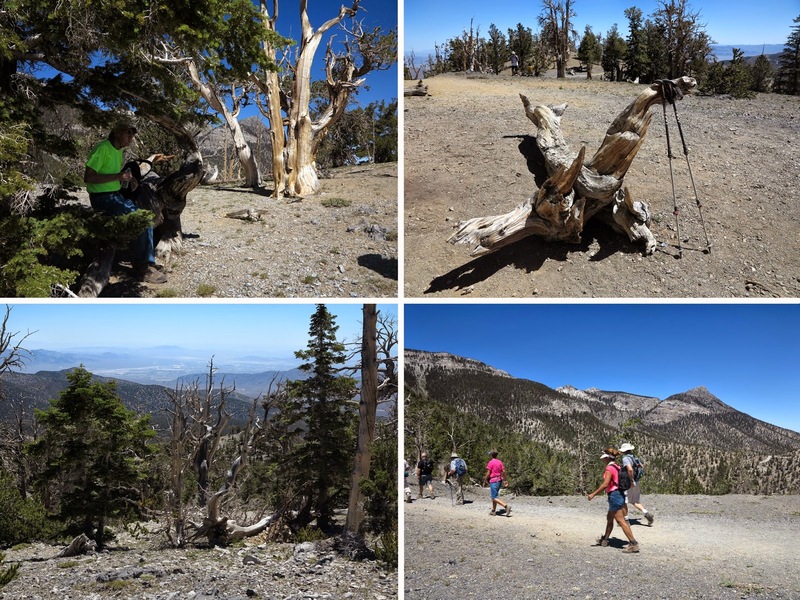 We all looked forward to a cool morning on a familiar trail as we parked at the Upper Bristlecone trailhead at the end of the Lee Canyon Road and started hiking. With the exception of a small group of hikers that we passed at the beginning, we had the trail to ourselves until we were on the way down. Everywhere that there was an open slope, there were wildflowers. Red, yellow and purple ... but mostly white. At one mile up the trail, we junctioned with the No Name Trail. Over the past few years, this trail has become very clear. It isn't difficult to follow it up next to a wash and ending on a saddle area. What is difficult is the climb! 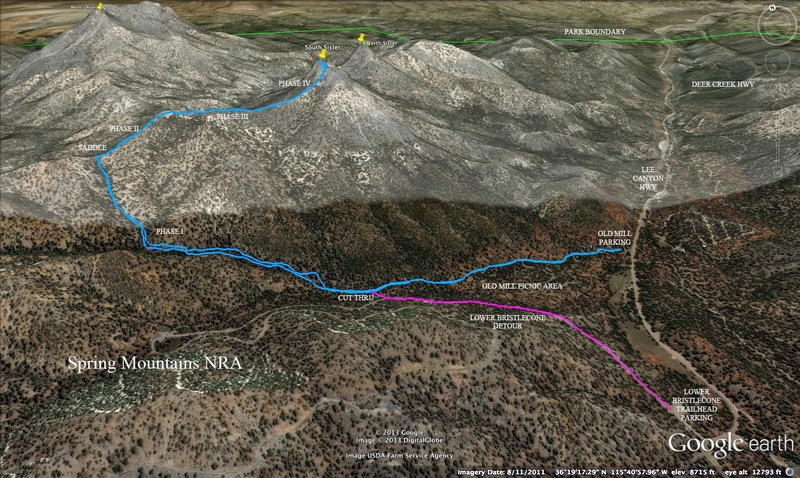 This next half mile is where most of the 1300 feet of elevation is gained. We moved up the trail slowly but surely. The forest was beautiful in the diffused light! We all reached the saddle within the same five minutes. This was our second regrouping. 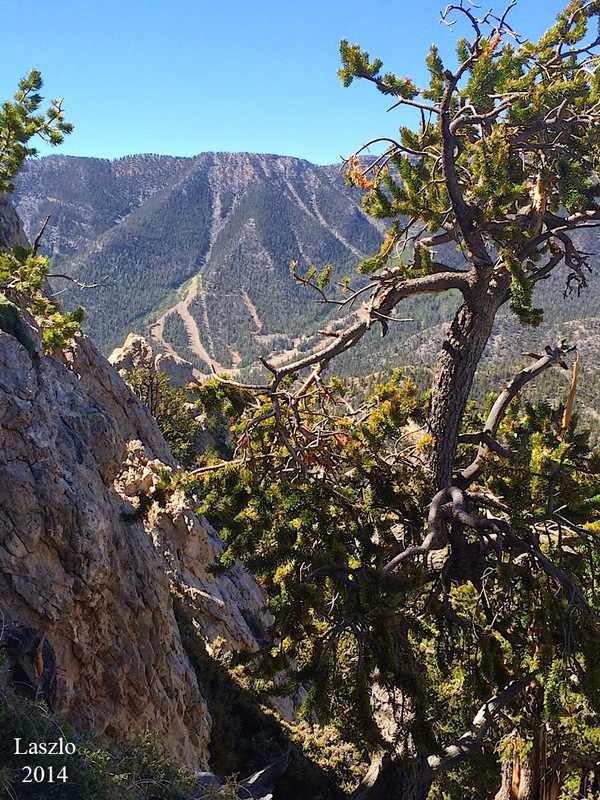 The next part of the hike is one mile through an enchanted forest of old bristlecone pines. The trail does not gain too much altitude here as we walked just below the ridge up to our right. To our left was a deep canyon of trees. 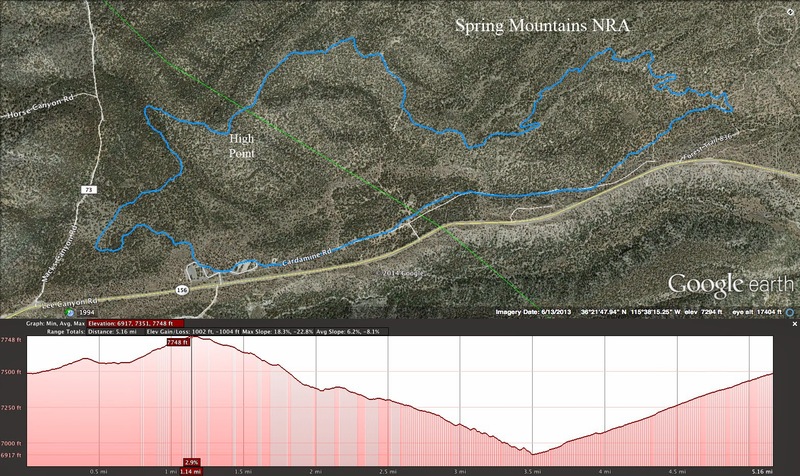 Except for a lagging photographer, the group enjoyed the mile together then found a log seat at the junction of No Name and Bonanza Trails. We sat here for our break and received the "full effect" of the cold June wind! When we started down the Bonanza Trail switchbacks, the wind disappeared.